I spent the better part of last week and the weekend lying prone on the couch. While I’m generally to be found in a horizontal position on most weekends, this was a bit of an exception. I’m still trying to recover from a severe bout of food poisoning that had me staring into the depths of my toilet bowl 8 times in a night. Needless to say, I wasn’t bouncing back as quickly as I usually did before. But the day after my insane bout of throwing up, I discovered that my body was rejecting plain water. What? I was trying to rehydrate and all plain water did was make me retch. It was a surreal moment for me, because I’d never experienced this before. I’d never had problem drinking just plain warm water before this. Fortunately for me, I remembered that a local “cure” for diarrhea and vomiting or food poisoning in general, is fresh coconut water from a young coconut. I managed to get a few, and they’ve kept me hydrated all through the weekend. In fact, it was all I could stomach in terms of liquids! Are you buying into the whole superfood theory? Or are you a fan of fresh young coconut water anyway? I’d always enjoyed a good cold coconut, freshly hacked open to enjoy the salty-sweet fresh clear water within, and if you’re lucky, the silky smooth flesh of the young coconut. This is a staple every time I’m in Thailand, because Thai coconuts are so lovely and sweet! They are also very hydrating and refreshing after tramping around the hot streets of Bangkok. But when I’m back in KL, I rarely used to buy coconuts. It always seemed to be more of “holiday drink” than a regular thing for me. But after this episode, I’m changing my mind, and I’m going keep my fridge well stocked with fresh coconut! You see, I’m lucky to live in a land where fresh young coconuts, which are the ones harvested for their water, are plentiful. I’m actually not a fan of coconuts in general, but what makes coconut water special is that it doesn’t have that distinctive taste and smell of a coconut. As the coconut ages, the water turns milky and oily, and that is what is generally used for making coconut milk or cream (“santan”) and used in cooking. I’m not a fan of that element of coconuts. But the water of a young coconut is quite something else. For one, the water hydrates the body just like plain water will, but it’s so much tastier. When your taste buds are dulled, whether by prolonged throwing up, or just from medication, it can be hard to drink plain water. Some people don’t even like the taste of plain water, which is why infused water is so popular. But coconut water does as good a job at hydrating the body, while being at the same time, refreshing and delicious! coconut water, to me, tastes a heck lot better than all the sugary energy drinks sold out there! Coconut water is also known to “cleanse” the system and promote health, which is helpful for those of us currently battling the thick smog that blankets our countries once or twice a year. When someone has a high fever or feels warm or “heaty”, coconut water helps to cool down the system and rebalance the yin and yang so you get better more quickly if you’re ill, or prevent you from falling sick, if you’re not. These days, at the supermarket, I see bottles and bottles of drinks purporting to the fresh coconut water. I know that due to the whole healthfood craze, they are now also easily found in many countries, but they cost a lot, and some of them contain additives in the form of sugars. I’d be very cautious because you might just be putting more unnecessary sugars in your body. Personally, as I’ve said, I’m very lucky to be living where young coconuts are plentiful and I can get fresh coconuts for between RM2.60-RM3.80 (under US$1 at current exchange rates) so I now keep a few in my fridge and plan to have them at least 2-3 times a week. If you’re thinking of doing the same, my advise is to buy the coconuts whole, if possible. Have the vendors trim off most of the husk, without exposing any of the flesh. They will keep better this way. I just hack them open with a cleaver (I run an Asian household so a cleaver is a must have in the kitchen! 😛 ) and stick a straw in to enjoy the fresh, sweet goodness. My personal preference lies with our local Malaysian young coconuts, which aren’t as sweet or as fragrant as those from Thailand, but which I feel have a more piquant flavour, and more liquid. Preferences vary from person to person of course! Locally, in the supermarkets, you can sometimes find coconuts that have most of the top half of the husk removed, leaving a thin layer of flesh. 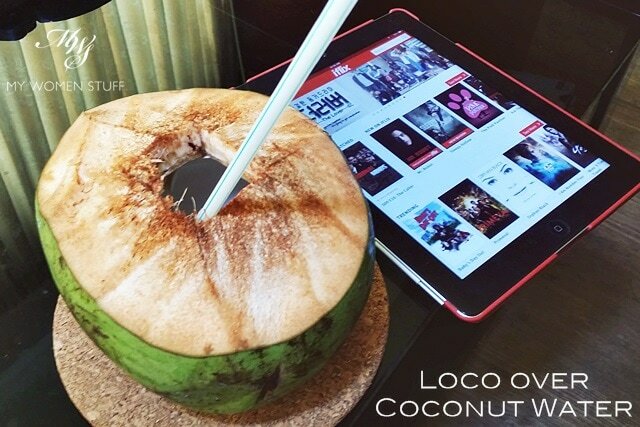 They call them “Kelapa Botak” or bald coconuts and they’re easy if you want to enjoy them immediately. Pop a straw through the flesh and drink. But be warned that these don’t keep very well. Ditto the ones that are freshly shucked from their shells and sold in containers. Are you too a fan of coconut water? Do you personally believe in the health benefits and do you drink it regularly? So that, my friends, is my recent revelation and love affair with coconut water. It took me a serious bout of food poisoning to discover something that people here have enjoyed and understood for hundreds of years. It isn’t an exact science, and I scoffed when I saw how coconut water was taking the world by storm. But I am now addicted, primarily for the reasons I’ve set out above, not necessarily from a health food point of view. I’m still not sold on the idea of bottled coconut water, but I count myself very lucky to live where coconut water has been a staple refreshment on a hot, sweaty day, and a cure for minor stomach upsets, and I’m glad I’m finally in touch with that part of my deep-seated SEAsian roots 🙂 What about you? all hail coconut! i love coconut! Fresh coconut water is awesome! It’s my family’s go-to drink whenever we feel the beginnings of the flu and it seems to work to ward off the illness most of the time. The other drink I resort to during food poisoning episodes is 100plus to hydrate, replenish electrolytes and giving me energy. It’s less healthy than fresh coconut water that’s for sure but when I’m in need of the toilet every 15 minutes, it’s more convenient to stock up on 100plus than fresh coconuts. Good tip on the flu Isabel! Next time I feel weird I’ll take coconut (beats falling sick!) Oh yes and good call about the 100 plus. Easier than hacking a coconut and does the same job haha! It’s the only time I indulge in soft drinks (ironically) so I have a bottle on hand now as well. Vomiting/diarrhea from food poisoning causes you to lose a lot of electrolytes, which would be my guess as to why plain water made you feel worse (because adding water = further dilution). I’m glad coconut water helped and that you’re feeling better now! I love fresh coconut water, but it’s both hard for me to find and impossible to open by myself lol. Hats off to your hacking skills! A secret that my doc let me in on recently (during my first ever bout of food poisoning, which was AWFUL): a little bit of sugar and salt in your fluids actually helps them stay down, so watered-down orange juice or a sports drink should work just as well as coconut water! I hate coconut water too hahaha! HIGH FIVE 😛 It’s….slimy. The texture bothers me for some reason, and I just can’t get on board with the whole trend. But I’m glad it worked for Paris though! Thanks for the tip Rae! I didn’t know that about using any ol drink. I used to take isotonic drinks before. Sorry to hear you don’t like coconut water 🙁 Have you had them fresh from the fruit? I’ve never tried the bottled versions so I can’t say if they taste the same, but if it’s anything like any other fruit juice, I’m going to warrant that it tastes better fresh than bottled. Thanks Jen. A little tender in the tummy still but getting there! You know I’ve never tried the bottled versions of coconut water so I can’t say if they taste the same but when I saw additives in the ingredient list I figured it wasn’t right. That’s interesting that it’s easy to get fresh coconut in California. I never did guess you know heh… As for your experience, if you subscribe to the Chinese traditional medication of ‘heaty/hot and cooling’ foods, that should explain why it makes you feel better. It’s restoring the yin/yang to your body! Mysticism at work haha! When I had my chicken pox, my dad bought some young coconuts; apparently, this is the usual remedies when people get chicken pox LOL A friend of mine, he had chicken pox at adult age and he bought tons of young coconuts to last the whole one to two weeks of his illness! Looks like it work to keep his body cold and whatever scars that he had didn’t last long (or maybe because he didn’t scratch at the marks, hehe). The young coconut juice is really refreshing but if buy those that they made into drinks, even if at stalls, they usually mix with ice cubes, sugar and some plain water, uhuh. Like you said, once the juice is extracted, it’s better to consume immediately within 24 hrs (2 days if get lucky) or it will go to waste. We have coconut trees at our house but the the one we have outside the gate is always get stolen, haha. So, I guess we have to rely on the trees we have inside the gated area. Ooh I didn’t know that about coconut water and chicken pox! Thnaks for the tip Fathin. I think it helps ‘cool’ the body that’s why? Oh I agree with you about those stalls that mix sugar and stuff into it. Ugh! I hate that! So I never buy air kelapa unless they hack it open in front of me. It’s like people who sell sugar cane juice and add sugar. I’m like Erm… What are you doing?! The latest I’ve seen is hair products with electrolytes and coconut water, which I’m currently testing. The latest thing I saw to be infused with coconut water is foundation. The Too Faced Born This Way. Have you tried it? I can’t deny I was intrigued but was so sceptical. I’d drink coconut water but I don’t think it’d actually work on the face lol! Yes, coconut water seems to be getting popular lately! I never used to like coconut water as a child (who did) but I’ve come to like it, especially when it’s in the form of coconut shake (which is probably 10% coconut water 20% vanilla ice-cream 70% water). When I was in KL a couple months ago, I bought Thai coconut at Tesco and it was spoiled hahah. My parents were enjoying theirs and I kept on complaining that it was a bit sour and fizzy, made me think maybe I’ve been lying to myself, maybe I’ve never liked coconut water at all. Anyway, coconut is my thing! Coconut fragrances, coconut ice-cream, coconut biscuits! Haha a true coconut-phile! I’m not a fan of anything that smells or tastes like coconut but the water I’m OK. I can’t believe you actually drank the spoiled coconut! Omg that might have given you a tummy upset more than curing it! Lol! Being born in Thailand, I grew up loving anything coconut, especially the water. I live in the States now. It makes me laugh at how mainstream coconut water has become here. It’s almost hoity-toity sometimes. A lot of things Asian are become popular in the States. It sort of makes me laugh sometimes because as a stranger to the States as a kid, Asians were made fun of. Now our “things” are becoming popular…am I too sarcastic? Anyway, I’m really glad you’re doing well now.Take care! Whenever I have UTI my family always make me drink coconut water whether or not I’m taking any medication.. They say it helps cleansing the urinary system, I also read somewhere that it is a natural cure for it.. I’m just a little bit careful drinking it because it makes my throat sore for some reason I do not know..
That’s interesting Karina! I didn’t realise that. I do drink it on an empty stomach – oops! Mostly as a pick me up during a hot day, and so far so good *touchwood*!